What is a Hotspot Gateway? 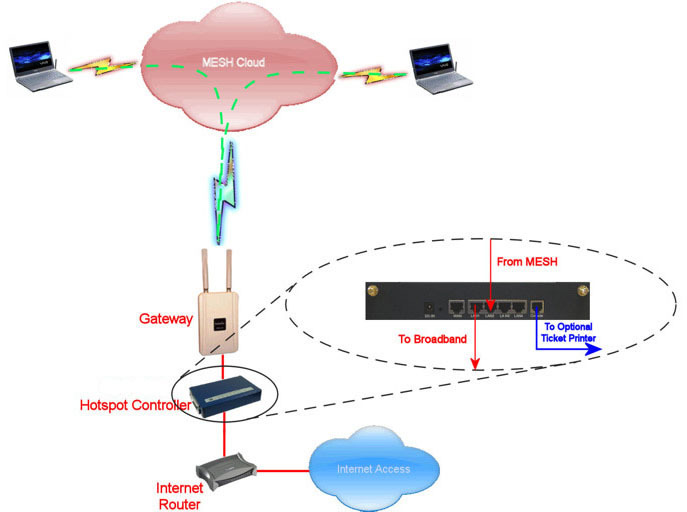 A hotspot gateway is a device that provides authentication, authorisation and accounting for a wired or wireless network. Typically they are used to control access to the Internet on a public wireless network; usually this would be in order to charge for the service or restrict access to certain users e.g. via a wireless hotspot on a holiday park. A hotspot gateway can also be used for guest (free of charge) user connectivity by offering instant Internet access without the need for configuration changes to the network setup of the client computer or any resident client-side software. broadband connection controlling all user traffic to the internet. The smallest controllers also include on-board wireless interface which can be used for local users; these users are also managed by the controller. So these are ideal for small location like cafes. Most controllers also have the option to interface to one or more Point Of Sale ticket printers which can be used to print tickets for on-demand users. Ideal if you want to install the system at a reception location of a cafe or restaurant. They can automatically generate user accounts both for fee-based or free broadband access. They also typically include powerful, supplementary firewalls for increased network security. Once your controller is configured then it can automatically provide access authentication using a simple username and password control. These users can either be by a built-in, prepared user-base or they can be created on demand. Most of the hotspots even support instant payment type services using, for example PayPal. With instant payment the hotspot will automatically interface with PayPal user charging - ideal if you want to run an unattended charging service. Most now also included the option of Facebook login which automatically 'likes' the user to your Facebook account. From the end users point of view, all they see is a simple logon popup box when they first attempt to connect to the internet. At this stage they can enter the username and password you've created for them or, if using instant payment, they can simply goto the charge site (e.g. PayPal) and pay for their connection. It's worth noting that in September 2016 the EU have advised that you should no longer run an open WiFi public network are you must also collate contact details for each user. "In that regard, the Court nevertheless underlines that, in order to ensure that deterrent effect, it is necessary to require users to reveal their identity to be prevented from acting anonymously before obtaining the required password." You will probably need some form of hostpot gateway to collect these user details e.g. using PayPal (if you want to charge) or via Facebook or a custom login page or simply noting them down when you give each user their unique access code. Click here to see our Hotspot calculator - see what hotspot gateway you need! Arrange a free phone consultation with one of our wireless solutions experts by leaving your details in this form. * Please note these solutions are suggestions only. All sites will require a site survey to establish their WiFi requirements.